For at least the last two thousand years, Jerusalem (Yerushaláyim or al-Quds) has been in the business of building tourist attractions for religious pilgrims. Shiny, hi-tech Davidson Center, not far from the spot Constantine’s mother pegged as Golgotha, is but one of the latest and most controversial. Built just a snub and a sneer from one of Islam’s holiest sites, it is Israel’s version of deep-well fracking. But not for oil or gas. No, Davidson Center is precisely placed for maximum extraction of funds from fundamentalists itching for Armageddon. There, on a stage far away, in the shadows of the Noble Sanctuary, on the “24th of Av” (August 24), stood a latter-day huckster with the rabble-rousing instincts of a TV evangelist. 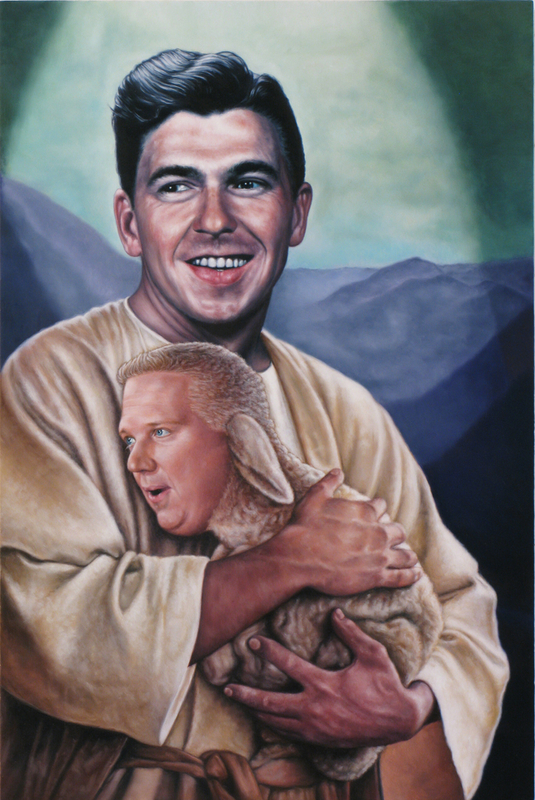 An emblem of insufferable shamelessness, pop-prophet Glenn Beck was drilling deep into the emotional fault lines of some of America’s most fanatical yearnings and anxieties. Exiled from even the far-right fringes of Fox News, Beck was now preaching only to a choir of mustered zealots. His audience this day was an aged chorus-line of one thousand beguiled tourists, bussed to the Davidson Center just in time for his much-hyped “Restoring Courage” pep rally. As if the Middle East’s only nuclear power needed to have its chutzpah restored. At the same time, halfway around the world in Hot Springs, Arkansas, about a hundred people showed up for a simulcast of what Israeli newspaper Haaretz derided as Beck’s “supportarama roadshow.” Most of our village idiots were in attendance, a motley gaggle of teabaggers, politicians, and a few curious, curmudgeonly onlookers like yours truly. As the big show started on the big screen, a speaker solemnly asked the Jerusalem audience (mostly white American Christians) to stand for Israel’s national anthem. They did, and so did we. Well, most of us. Except for a dozen or so notable — ahem — exceptions, the Hot Springs Hundred (mostly white American Christians) dutifully rose as one while Hatikvah played on and on. And on. For tent-revival spectacle carefully choreographed for television, it was dull. Dull, dull, dull. Plodding, minor-key amateur hour. The infamous, connect-the-dots wacky chalk talk was missing. Even the much-awaited fount of Beckish weeping was postponed until the very end. There were a few enthusiastic outbursts. “The Courage to Stand” was pregnant with long pauses and gotcha! lines that begged for an outbreak of happy clapping. One line that clearly resonated with audiences hither and yon was an early dig at “the combined and cold hearts of every bureaucrat at the United Nations.” Applause erupted as soon as Beck finished reading that. Not too surprising, since our local conspiracy theorists (and they are legion) are convinced that were it not for their stalwart vigilance, Fidel Castro himself and his swarthy band of UN desperadoes would be goose-stepping Central’s scenic sidewalks. Given our national appetite for fear and loathing, it was not surprising that there were scattered, spontaneous huzzahs and hosannas at Beck’s every suggestion that you-know-who “theys” and “thems” were determined to smite the Israelites. Courage in the face of terrorism against Israel was a centerpiece of the gala evening. Terrorism in the other direction, of course, was completely redacted. Beck’s speech was absolutely silent on the subject of Israel’s prior peoples, conveniently cleansed from the blood-soaked “Holy Land” landscape. The gospel according to Saint Beck transformed Israel into a legendary phoenix risen from the ashes of desolate Palestine, fallow since the days of Roman diaspora. Beck was a carnival barker shouting out well-rehearsed fictions to a crowd of smattered sycophants, but his fevered romance of Israel without Palestine was like Custer’s Last Stand without the Indians, or the antebellum South without slavery. It was an unreal version of reality peddled to a dwindling congregation of true believers. To those faithful few, it was Good News indeed — the “courage” of Beck’s fantasy Israel will save America. And if you focused on the pale tourists feebly waving their little plastic flags, you could almost overlook the pathetic scene of Davidson Center’s too many empty plastic chairs. You could almost ignore the jeers of those outside the Davidson Center, who refused to attend an extravaganza orchestrated purely for the consumption of Christendom’s zaniest outliers. But the sermon on this day was not for profligate sinners, but for Beck’s chosen people. On this day, no one was saved. No prodigal sons returned to the fold. No, this was a day for preaching to the choir. Manna from Beck was offered up for his remnant wanderers starving in the parched wilderness of their own delusions. He fed them well and all the people said Amen. And it was a day to remember. Not to be out-maneuvered by his new partner in the evangelical business, Glenn Beck has decided to raise the stakes in the battle with Pastor John Hagee over who can pander more to the Jews and Israel. Little did Beck know that when he invited Hagee to the “Restoring Courage” event that took place this Sunday in Caesarea, his mentor would fight back in style and shout at a roaring audience “Ani Yisraeli – I am Israeli!”. Sources close to the two told +972 that after Hagee left the stage, Beck could be seen crying. The sources could not confirm if this was because of Hagee’s move, or just Beck being Beck. I love your letter – Eloquent as always. Have you sent it yet? There needs to be an answer to that to that idiot letter in today’s paper by Bournival. The Restoring Courage viewing party held at the Champion Baptist College cafeteria in Hot Springs was a marvelously inspirational affair. Approximately 150 people attended the event, which began with a potluck social hour while a preshow was video streamed directly from the foot of the ancient temple wall in Jerusalem, Israel. Restoring Courage was then telecast from Jerusalem and was the “main event” of the evening. It was Glenn Beck’s encore to the Restoring Honor event that he held in Washington, D.C., in August 2010. Restoring Courage brought together dignitaries, celebrities and ordinary people from around the world who are practitioners from three major world religions – Jewish, Christian and Muslim – to stand in solidarity with Israel. All three religions trace their history directly from Abraham and though each may have traveled different roads through the generations, all continue to return to Jerusalem to worship and pray at the throne of God. Jerusalem is the sacred heart for all three religions. As such, it is critical that this holy city of Jerusalem remain free for all people to continue to come and worship at their sacred sites according to their faith. It is why we must all stand together and persuade the United Nations that it is the interest of all mankind to dismiss any attempt to divide this sacred city and confiscate even a portion of it from Israel. There were several speakers and entertainers and three special awards were presented. The first was given for Faith in memory of a young family (husband, wife and three children ranging in age from 7 months to 11 years) who had been violently murdered in their home by two terrorists simply because they were Jewish. The second was for Hope presented to a married couple – one a Jew and one an Arab. Their restaurant was the target of a deadly suicide bombing attack because it was acknowledged as a place that welcomed everyone, regardless of faith or origin. The couple survived the attack and ignoring their personal safety, reopened the restaurant. The third medal was given for Charity to a man who came from very simple and humble beginnings but now has over 20 grocery stores in Israel that employs and serves Jews and Arabs equally. He makes sure that customers of every faith have the groceries available to celebrate religious holidays or practice spiritual rituals – even giving freely to those who cannot afford it. His daily commitment to serve all humanity, regardless of threats and personal sacrifice, is truly inspiring. I am speaking for myself, but I do believe most, if not all, who experienced this remarkable event were feeling the same inner peace and love that I felt as we reached the end. I believe Glenn Beck and all the guest speakers effectively inspired people across the planet to reach out in courage, equipped with a newfound sensitivity toward humanity and awareness to the need for individual responsibility. Hate is a sickness that infects people far worse than any plague or disease. God’s love is the remedy. Let us follow Him as we go out like doves spreading our wings in faith that God is always with us, with hope for a more peaceful world and with the courage needed to create God’s heaven on Earth. 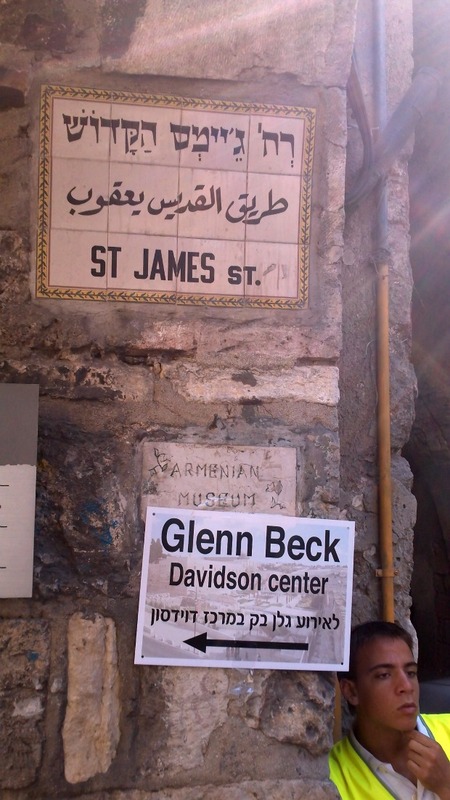 Elmer Gantry, posing as Glenn Beck, preached live from Jerusalem on Wednesday, Aug. 24. What an odd event, nine parts revival and one part politics. Aghast, I watched on live video stream at Gospel Light Baptist Church as this Mormon prophet pontificated for two hours at a fundamentalist church. And what a sermon it was! Beck at his “I’ll save-the-world” Messianic best, the crocodile tears welling up profusely but not quite falling (He simply must work on his tears – an onioned handkerchief, maybe?). Beck’s sermon/political diatribe did not call for Middle East peace, but then how foolish of me to expect such of a tea party/Republican/Christian event (GOP brochures in abundance) where, like the Holy Trinity, these three entities meld into one until the parts are indistinguishable. No, Beck embraced continued war, conquest, occupation, and death – you know, all those forgotten Christian virtues that Jesus Himself forgot to mention because He was too busy talking nonsense about peace, grace, tolerance, compassion, mercy, forgiveness and loving one’s enemies? So, looking at things historically and from God’s standpoint, Beck concludes that if God can occupy and purify the land, so can Israel. And ’Merica must support Israel, right or wrong. Never mind the Palestinian babies killed by Israeli airstrikes. Don’t think of such meaningless “collateral damage,” no matter how innocent. No, let’s focus on these heartwrenching photos of tiny Jewish children slaughtered by the terrorists. The only acceptable response is to airstrike a few more Palestinian child terrorists in Gaza. I am personally pro-Israel and I defend its right to exist. I am also fully aware of Palestinian atrocities. Palestinian suicide bombers kill Israelis indiscriminately, including innocent children. Why, then, is it so hard for Christian Zionists like Beck and John Hagee to acknowledge the same suffering, pain, and death of little Palestinian kids, some of whom may even be from Christian families? So it was on this night. Complex issues simplified, made black and white. “Us versus Them.” Right versus wrong. All crystal clear. Israel is right, and Palestinians are wrong. Christian ’Merica is right and Islamic heathen nations are wrong. No shades of gray. No nuanced views. No rational analysis. My country, ’Merica, right or wrong. Their country, Israel, right or wrong. Yet, strangely, Jesus made Himself absent from this self-described Christian “non-denominational” event. Nobody mentioned either “Jesus” or “Christ.” Nope, not one time throughout the two-hour revival posturing as a political event. Nobody ended a prayer in His Name. Nobody mentioned Him or His teachings. A Christ-less “Christian” event.